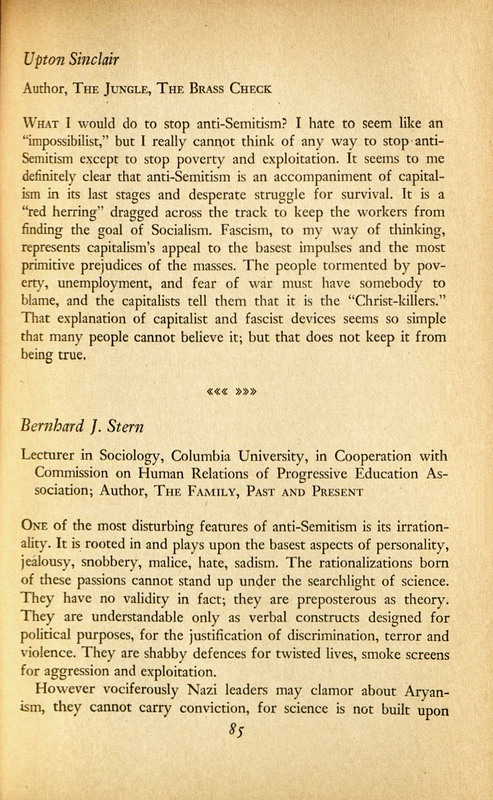 As discussed in a Peek in the Stacks post from 2014, antisemitism is a form of discrimination directed at Jewish people or Judaism in general. 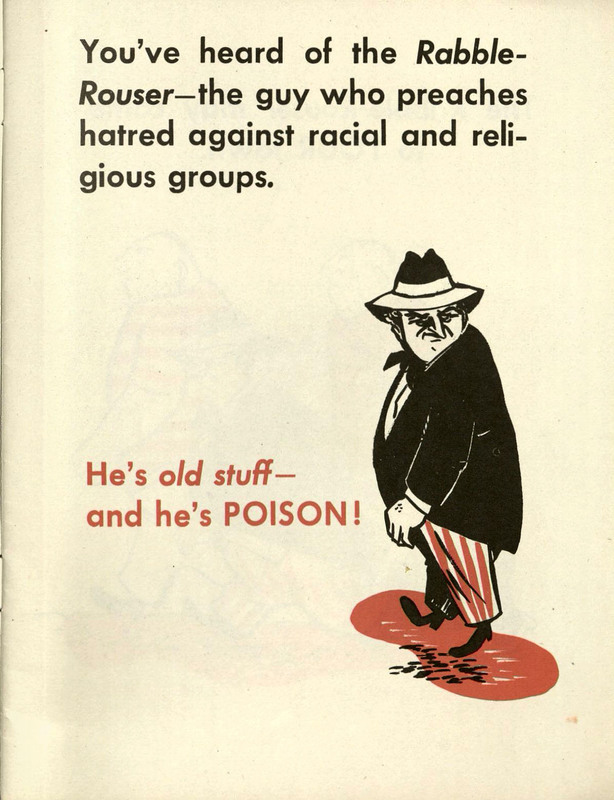 While most scholars agree antisemitism has generally been less prevalent in the United States than in Europe, there are numerous documented incidents of antisemitic behavior and sentiments in America dating to the Colonial era. While the popularity of antisemitic ideas in the US fluctuated through the 18th and 19th centuries, they saw a resurgence in American culture in the years between World Wars I and II, concurrent with a wave of antisemitism across Europe. Some historians argue antisemitism peaked in the US during the 1920s and 1930s, as it experienced high levels of acceptance across large swaths of society at that time. 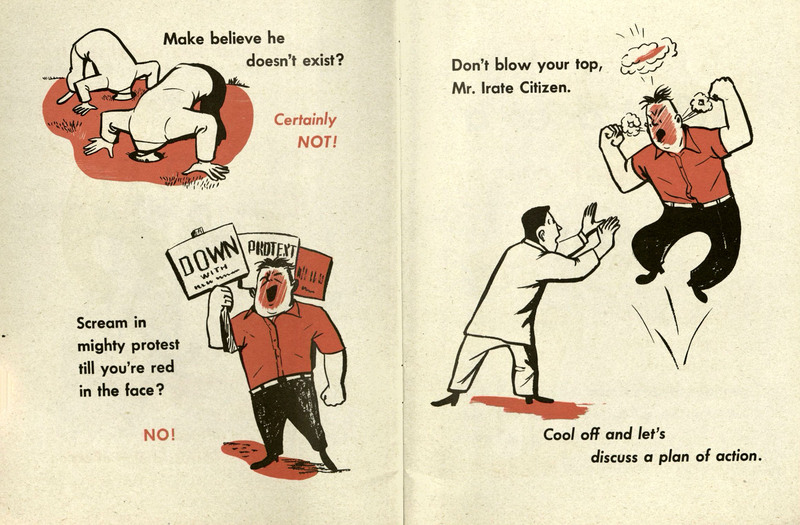 Even so, many in the US fought against these hate-filled and discriminatory ideas and practices, believing them to be fundamentally un-American at their core. 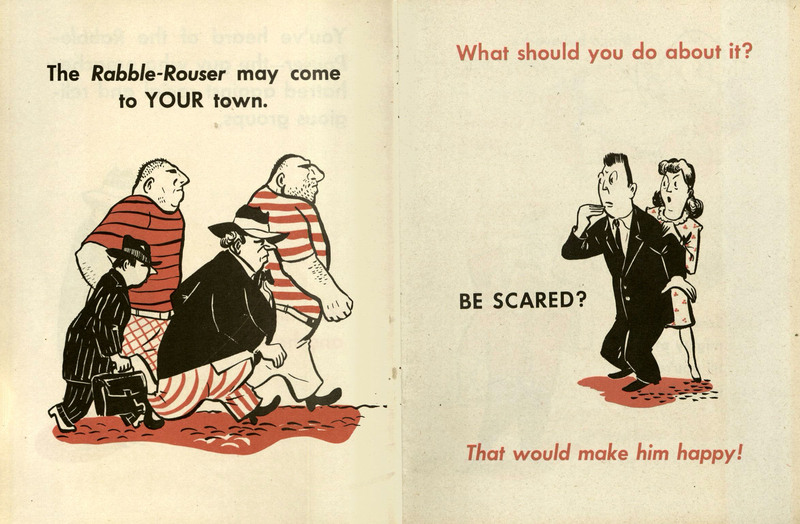 Individuals from religious, professional, and other communities united to persuade their fellow citizens against antisemitic beliefs and behaviors. 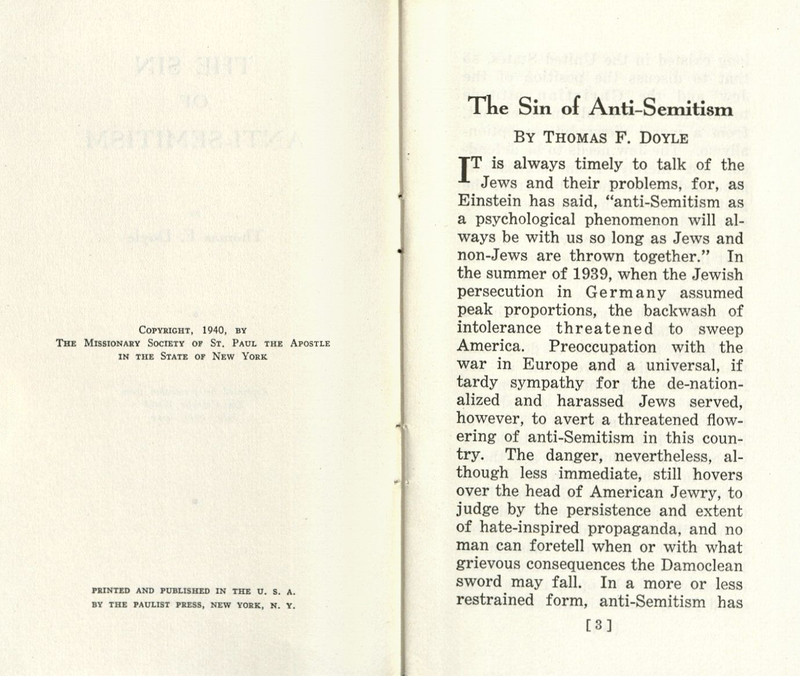 A booklet titled The Sin of Anti-Semitism was authored by Thomas F. Doyle, a Catholic, in 1940. Doyle passionately argues that many Catholics must "cleanse their minds of racial and religious intolerance" before he systematically debunks popular misconceptions and stereotypes about the Jewish community. He concludes by stating any true follower of the Catholic faith must conclude the message of antisemitism is "a mockery and insult." 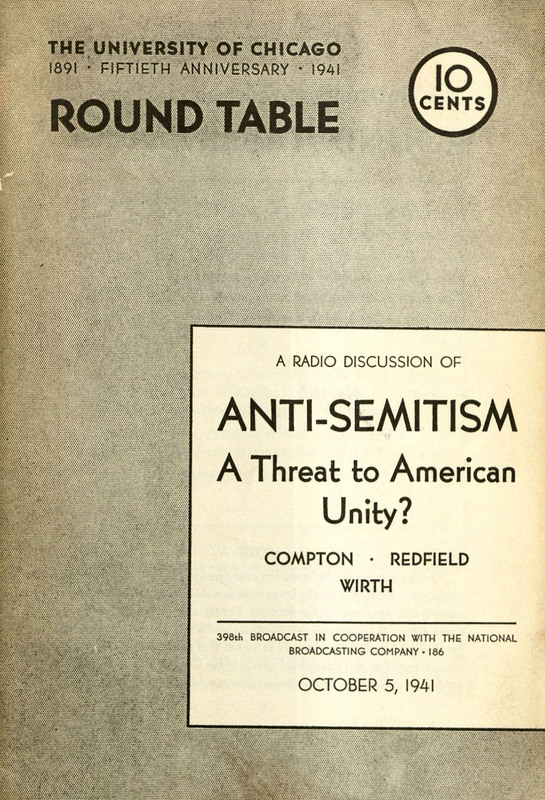 Conversations surrounding the pervasiveness of antisemitic thought in the US also occured in secular settings, as in a transcript of a joint NBC-University of Chicago radio program titled Anti-Semitism: A Threat to American Unity?. During the program a professor of physics, a professor of anthropology, and a professor of sociology discussed whether antisemitism is a threat to "American unity." They began their discussion by stating others had advised them to avoid talking about the issue, and explaining why they felt it was important to hold conversations about it publically. 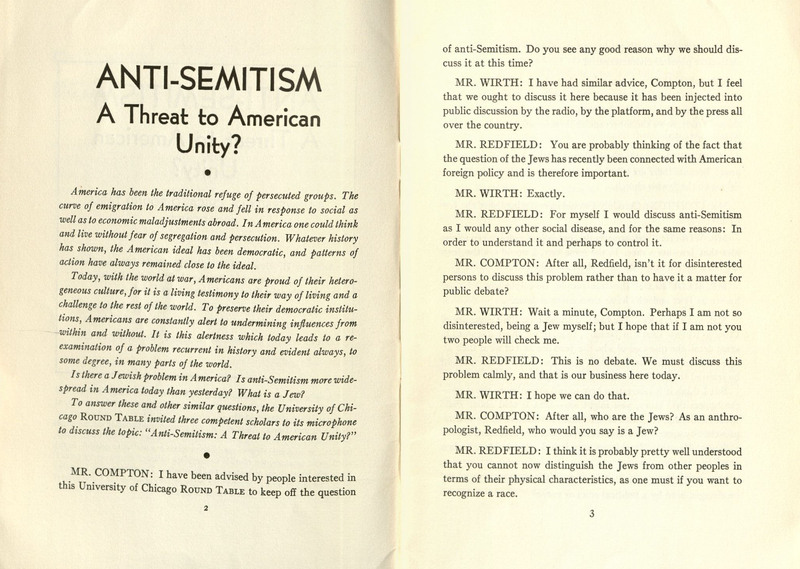 Together they worked to better inform their listeners about the issue, and correct common misconceptions about the Jewish community, Jewish immigration to the US in the 20th century, and negative stereotypes from the framework of their respective academic disciplines and their own experiences as Americans. 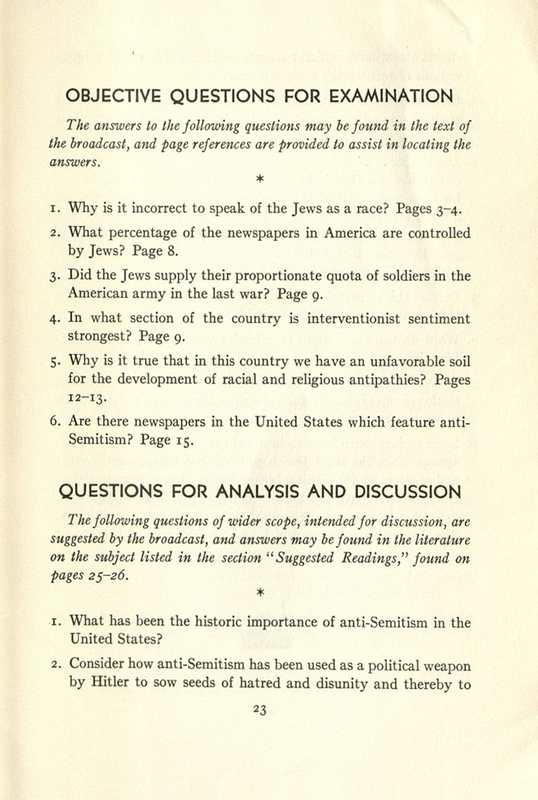 They also emphasized the role foreigners played in fomenting antisemitism within the United States, and examined some of the tactics antisemites used in public debate to frighten and confuse Americans. Their discussion ended with an emphasis on our shared American identity, and a description of the United States as a country that consists entirely of minority groups. The League of American Writers was an association of novelists, playwrights, journalists, critics, and others. 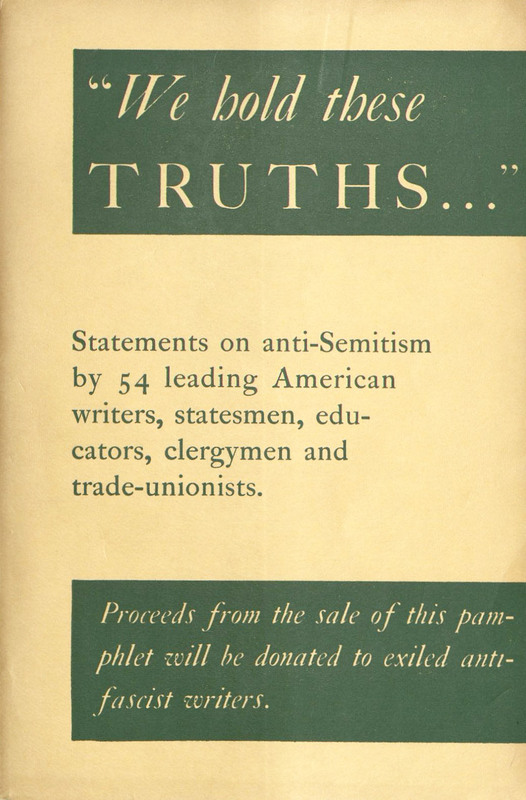 Formed under the auspices of the Communist Party USA, the League published a booklet titled "We Hold These Truths...": Statements on anti-Semitism by 54 Leading American Writers, Statesmen, Educators, Clergymen and Trade-Unionists. 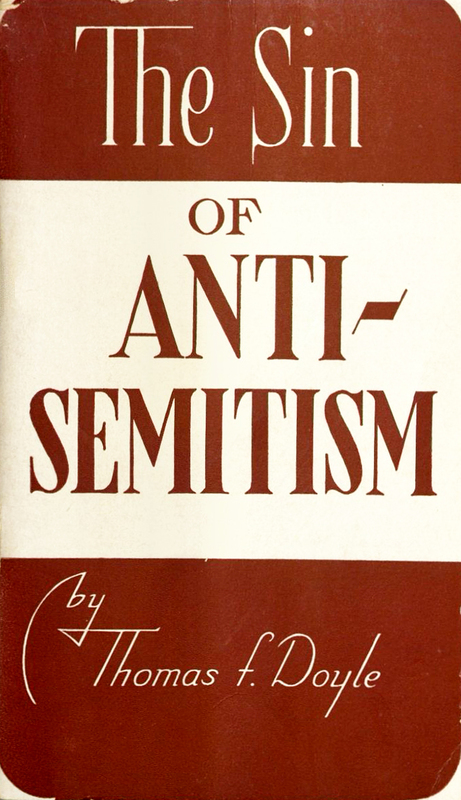 It includes statements by authors like Langston Hughes, Upton Sinclair, and others who uniformly pronounce their strong opposition to antisemitic ideas and practices. While some propose political solutions, statements like Upton Sinclair's instead focus on economic struggles as the primary culprit for the rise of antisemitism in the US. 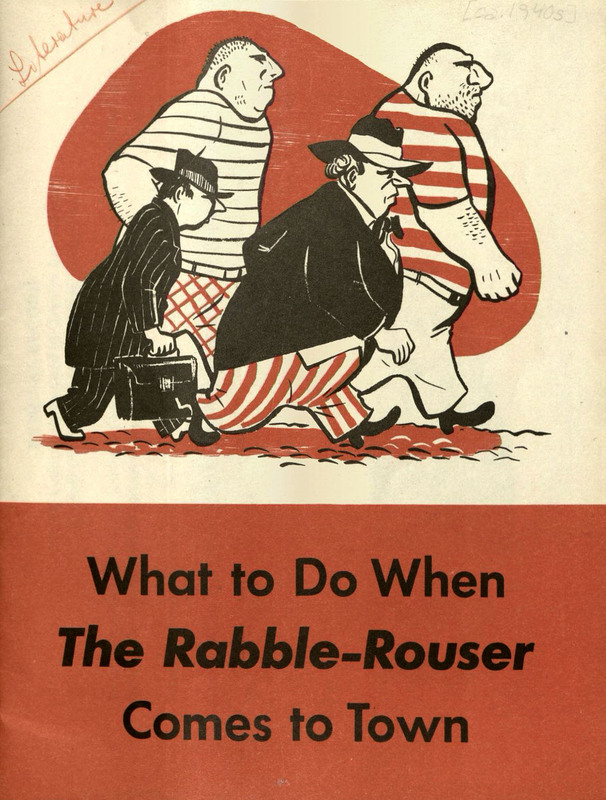 Finally, a pamhlet titled What to Do When the Rabble-Rouser Comes to Town suggests straightforward strategies ordinary Americans can adopt to prevent antisemites and others from preaching "hatred against racial and religious groups." 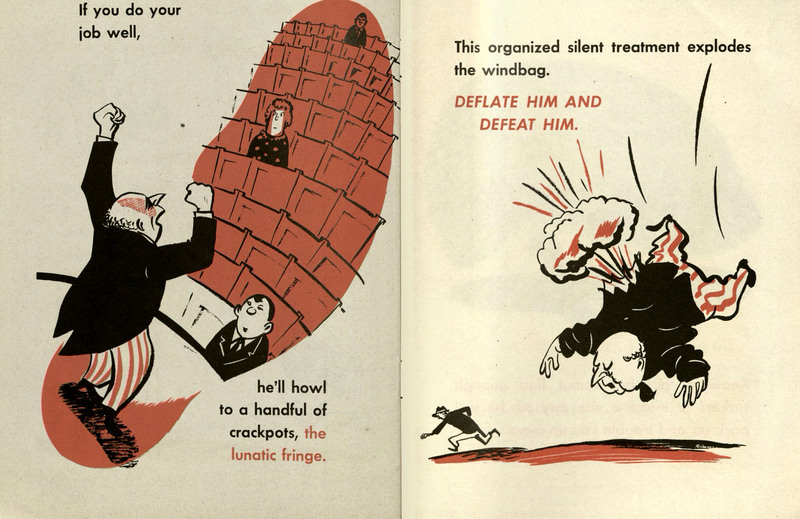 After emphasizing the futility of feeling fear, pretending the ideas don't exist, and otherwise becoming frustrated and angry, it suggests communities work together to deny free publicity to individuals pushing hateful ideas, remember the ideals that underpin democracy, and work to give prejudiced individuals "organized silent treatment" until they "howl to a handful of crackpots, the lunatic fringe."